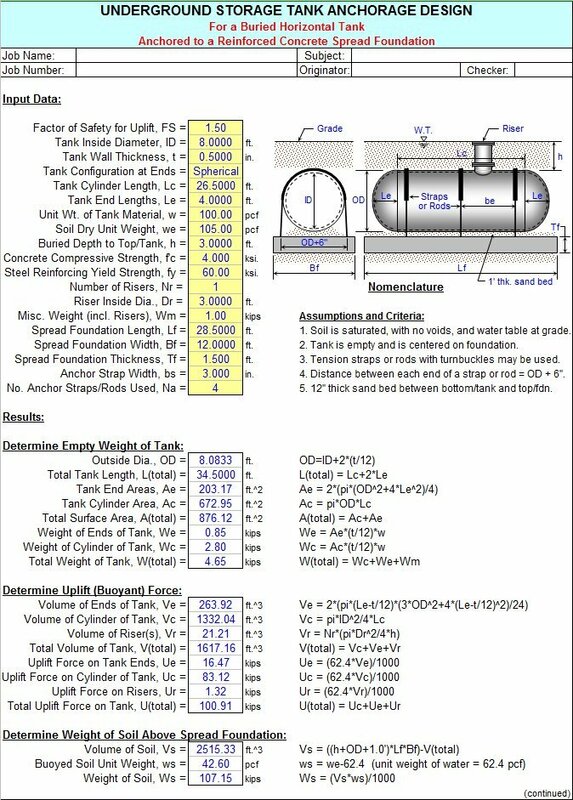 UGTANK.xls workbook is for the analysis and design of anchorage for underground storage tanks, obviously addressing the concerns of buoyancy. I've had this workbook in a partially finished state for quite a while, and I just recently decided to complete it. This is not a subject that we encounter on a regular basis, but if and when you need it, hopefully it will prove to be helpful. a. Lockwood Greene Engineering Special Design Instruction No. 38, "An Approach to the Design of Anchorages for Underground Storage Tanks", dated December 6, 1972.
b. Lockwood Greene Engineering Special Design Instruction No. 31, "Design of Anchorage for Underground Storage Tanks", dated January 14, 1972. 2. This program utilizes the procedures and guidelines per the ACI 318-99 Building Code in the design of the reinforcing for the concrete spread foundation. 3. This program refers to the AISC 9th Edition (ASD) Manual, 1989. The values for safe working loads for turnbuckles are taken from the table on page 4-149 of the Manual. 4. The soil is assumed to have no voids and is assumed saturated with water (water level to top of grade), while the tank is assumed to be empty. These conservative assumptions result in largest possible buoyant force. 5. This program permits the user to utilize either steel tension straps or threaded rods with turnbuckles to secure the tank to the foundation. Note: if turnbuckles are used, then they will control the required threaded rod size. 6. This program assumes that the empty tank weight is subtracted from the buoyant force in determining the tension force in either the straps or anchor rods. 7. The program assumes that the distance between the ends of a strap or rod is equal to OD + 6". 8. 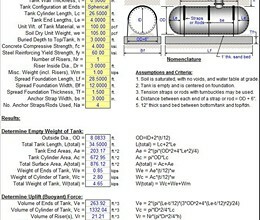 The program assumes that the tank is centered on the spread foundation. 9. For the design of the foundation reinforcing in the short direction, this program assumes a uniformly loaded simple span beam strip with cantilevers (overhangs) at each end. The ends of the anchor serve as the supports. The assumed uniform loading on this "beam strip" is determined as 2 times the anchor tension divided by the foundation width. 10. This program does not address the anchorage of the straps or rods to the concrete foundation. That must be separately by the user. 11. Underground tank should be bedded on 12" of compacted sand rather than bearing directly on the concrete spread foundation. This will protect the integrity of the tank and minimize possible failure of the tank joints. 12. Provide turnbuckles in the tank anchor straps. This allows for final adjustment. Where flat straps are used, this will necessitate welding a round bar extension to accommodate the turnbuckle. 13. This program contains “comment boxes” which contain information including explanations of input items, etc. (Note: presence of a “comment box” is denoted by a “red triangle” in the upper right-hand corner of a cell. * UGTANK download link provides freeware version of the software. ROOFDECK is a spreadsheet program written in MS-Excel for the purpose of analysis and design of roofs with steel deck. Slab on metal deck analysis and design (both composite and form deck) per SDI and ACI 318-99. POLEFDN is a spreadsheet program written in MS-Excel for the purpose of analysis of a pole foundation assuming the use of a rigid round pier which is assumed free at the top and subjected to lateral and vertical loads. FOOTINGS is a spreadsheet program written in MS-Excel for the purpose of analysis of rigid rectangular spread footings with up to 8 total piers, and for either uniaxial or biaxial resultant eccentricities. GRDSLAB is a spreadsheet program written in MS-Excel for the purpose of analysis of concrete slabs on grade. UGTANK has been rated 5.0 out of 5 points. A total of 2 votes cast and 0 users reviewed the software. LTBeam is a software which deals with the elastic Lateral Torsional Buckling of Beams under bending action about their major axis. EBPlate is a piece of software developed by CTICM with a partial funding of the European Research Fund for Coal and Steel (RFCS). It assesses the critical stresses associated to the elastic buckling of plates loaded in their plan. Ftool provides a simple analysis program that merges, in the same interface, resources for effective creation and manipulation of the model, linked to a fast and effective code for visualization of the results. BASEPLT9 is a spreadsheet program written in MS-Excel for the purpose of analysis of steel column base plates. Use the optimal plastic stringer model solution to design shear walls, concrete diaphragms etc. ConcreteBending helps you model concrete bending problems using high-level components and engineering terminology. VAConnect is a set of two steel connection design utilities. Run these stand-alone, or use integrated with VisualAnalysis. ConcreteSection helps engineers to understand the cracked behavior and load capacity of custom reinforced concrete sections.